Our Client held a contract to transport via barge, goods and products from their base in henderson to Barrow Island for the Gorgon project. At low tide the barges were too low compared with the wharf and loading had to be ceased until the tide increased again. 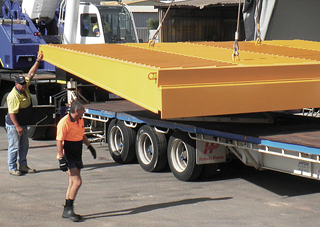 TCG Industries were contracted to fabricate and supply a low tide transition piece (to hold ramp up at low tide). This piece measured approx 6.1mtrs x 4.5mtrs x 1.2mtrs high and weighed over 12 tonne. It was coated in a specialised marine coating followed by anti slip painting.